2 Hotmail Sign In Problems and Troubleshooting. 2.1 I forgot my Hotmail password and need to reset it. 2.2 I cannot login to my Hotmail account. 1- Open your internet browser and type www.hotmail.com in the address bar. You are re-directed to the new login page url at https://login.live.com/. 3- Enter your Hotmail password. 4- Check the option “Keep Me Signed In” iff you are on a secure connection. Enter your email address and click on “Next”. Hotmail Sign In Problems and Troubleshooting. Hotmai is a great, free email service. One of the better, in our opinion. But occasionally, users will face problems with logging in to their Hotmail account. This page will help narrow down the login problem, and troubleshoot the issue for you, if you cannot log in to your Hotmail account. I forgot my Hotmail password and need to reset it. It happens to the best of us: Forgetting a password that we don’t use that often. Go to the Reset your Windows Live/Hotmail password page. Choose the reason for the password reset, then click Next. Choose between: Why can’t you sign in? Enter the Hotmail account email address that you’re trying to recover. Enter the Capcha characters you see on the screen, click Next. 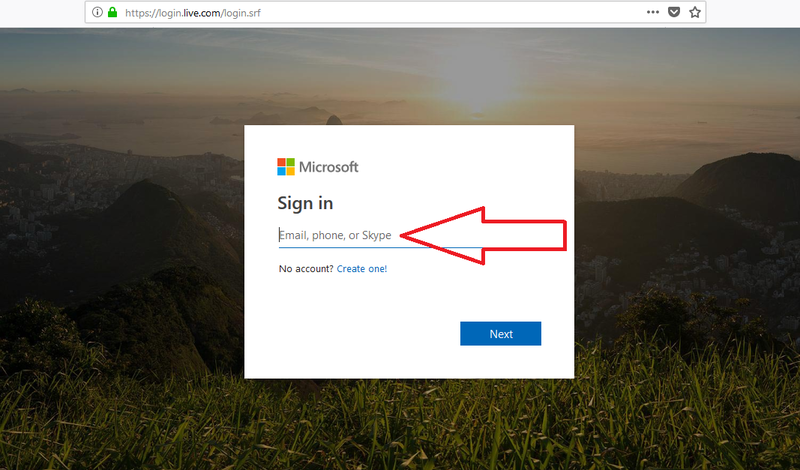 Windows Live/Hotmail will send a one-time code to your listed phone number or alternative email address that you gave at sign up. Enter the code and make a new password. I cannot login to my Hotmail account. First of all, you must have an live Internet connection to access your Hotmailaccount. Visit some other websites to see if your internet connection is working properly. You can also check that the Hotmail website is down (unlikely) by visiting http://www.isitdownrightnow.com/hotmail.com.html. Try another Hotmail login page, like www.hotmail.com, https://outlook.live.com or https://login.live.com. Try downloading the Connect for Hotmail app or Outlook App and sign in via the app. Try to close all your open internet browser windows and re-open them. Then attempt to sign in to Hotmail again. Try opening the Hotmail/Windows Live login page with a different Web browser, like Mozilla Firefox, Opera, Chrome or Internet Explorer and try to log in again. Try signing in to Hotmail/Windows Live from another device, e.g another mobile phone or a different laptop. Clear your internet browser’s cookies and cache. Try disabling all browser tools, plugins and add-ons, that could possibly block the Hotmail login process. Check your computers or mobile phone’s anti-spyware, firewall and anti-virus programs settings. Disable them one by one and try to log in to your Hotmail account again. If you are still having problems logging in to your Hotmail account, then share your problem below.